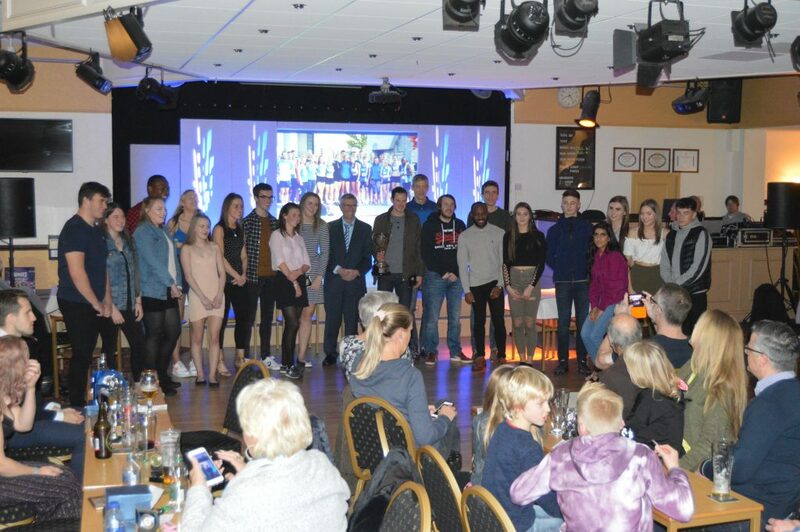 It was standing room only at this years Presentation Evening held at Mill Hill Working Men’s Club. 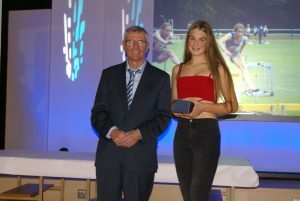 Some 200 members of the Harriers came to celebrate the achievements of all of the athletes, of the teams and the Club as a whole in the previous year of competition. 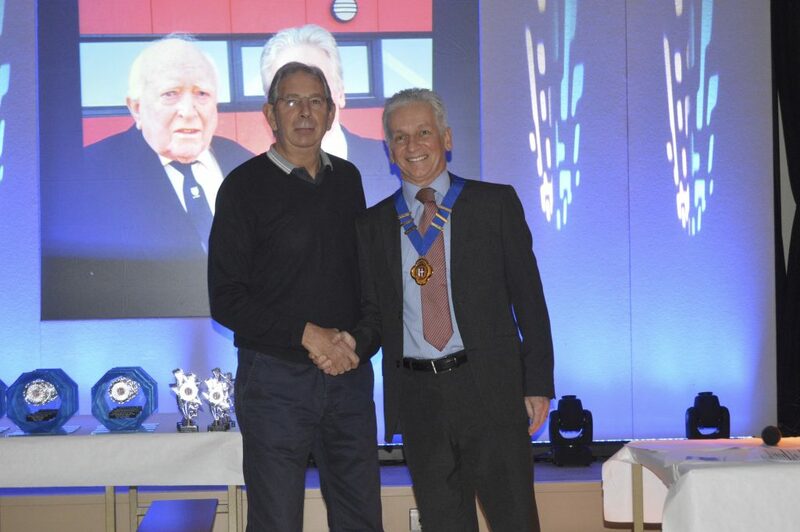 There was a special moment at the beginning of the evening when George Woodburn who joined the Harriers in 1965, presented the Presidents Medallion to the newly elected President Tony Wood. 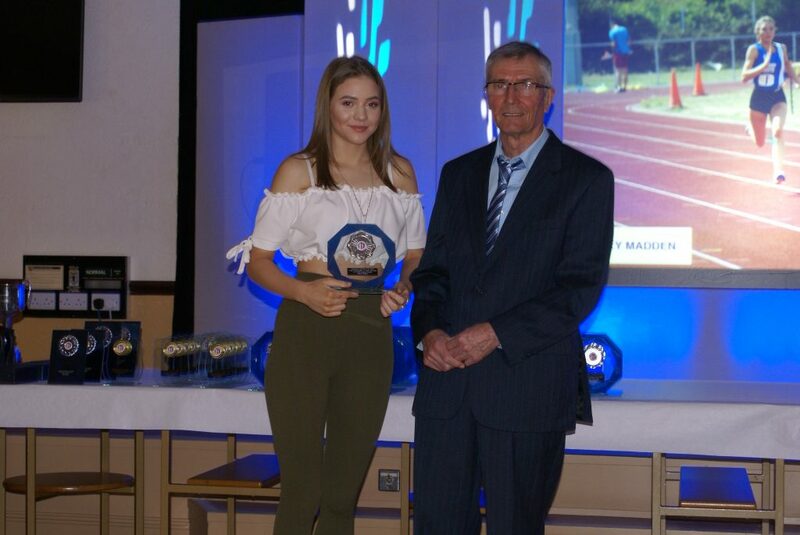 In presenting the Medallion – which featured all the names of past Presidents back to 1910 – George Woodburn paid tribute to Tony’s 45 years of dedicated work for the Harriers, as an athlete, team manager, Committee Member and Senior Club Officer. 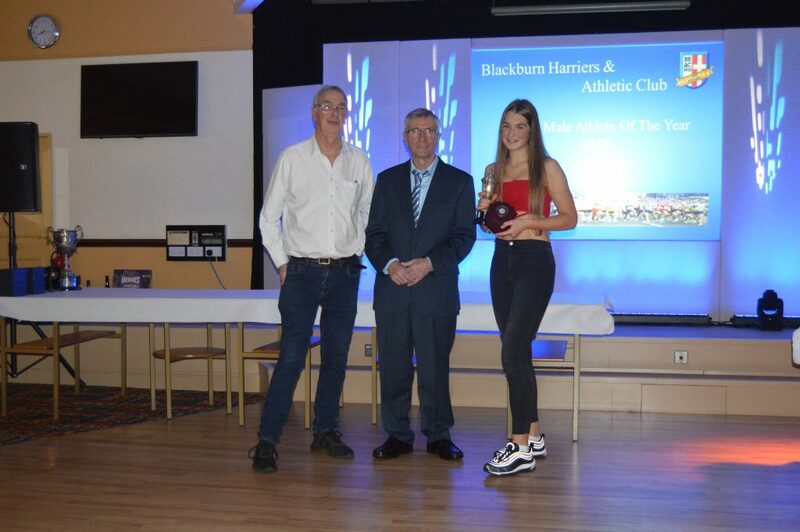 In accepting the Medallion, Tony talked about the role that our former President – George Kirby who had sadly passed away recently – had played in the building and development of Blackburn Harriers, covering nearly 70 years. 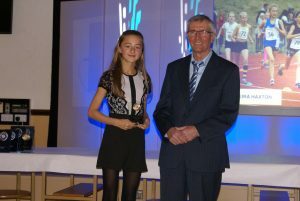 The tributes that have poured in from the athletic world alongside that of the new Club president, are testament to the affection that George Kitby was held in throughout the athletics world, at local, regional and national level. 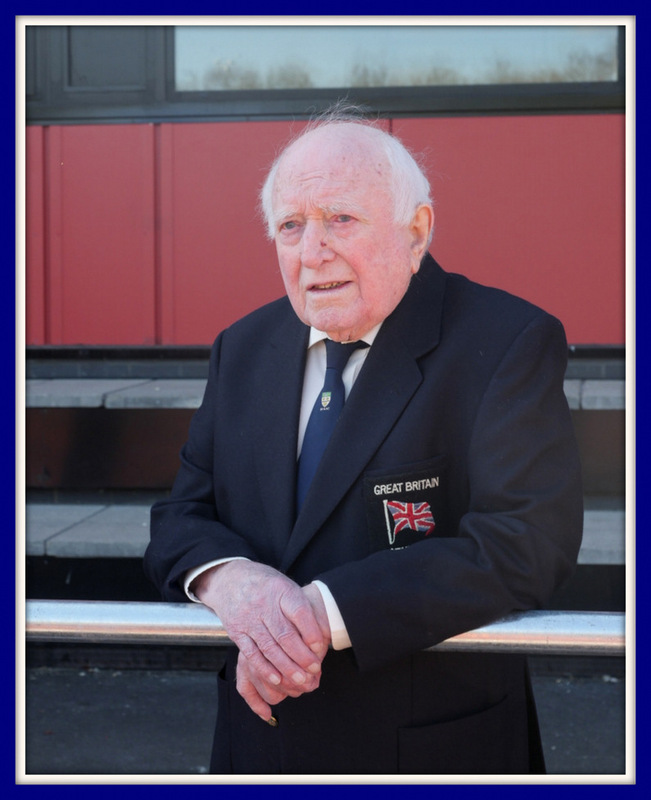 He made his mark, inspired and mentored many and his contribution will be greatly missed. 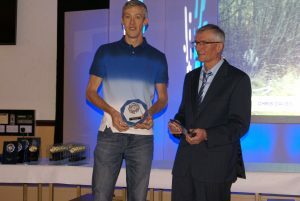 A second special moment came when Tony introduced the evenings Guest Presenter – Joe Fleming. 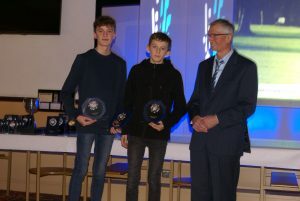 Joe had been the Harriers High Jump Coach for many years and has recently had to step down from that role, but in his time, he had seen the emergence of a number of talented High Jumpers, including Rob Brocklebank (2.17m) and Joseph Pearse (2.08m) as well as many others who have competed at a good level under his caoching and guidance. 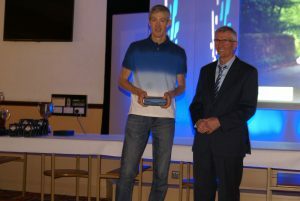 During the course of the evening there were a couple of special Awards given – the first being the The Bob Goves Trophy. 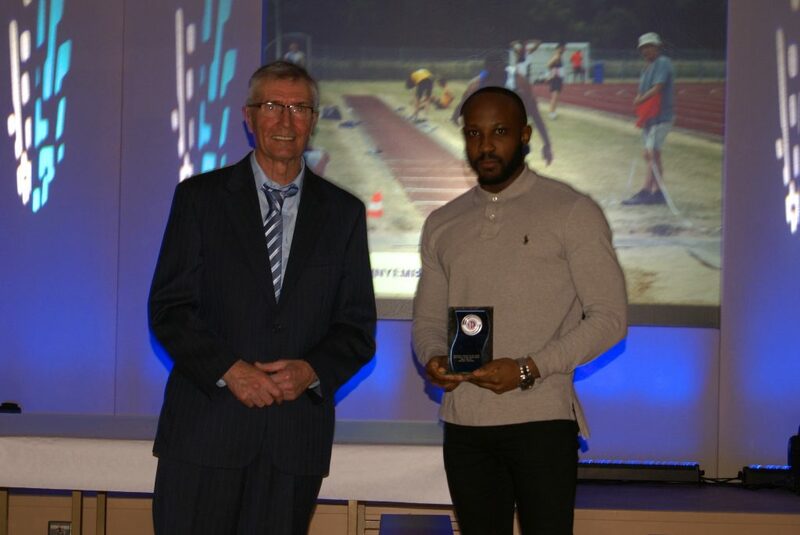 The origin of this Award comes from the Club’s Hurdles Group, who wished to make it an annual award, given to the best hurdler as judged by themselves. 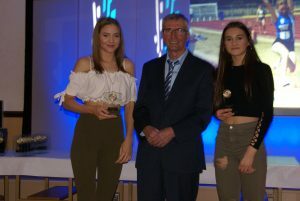 The Hurdlers gave the name to the Trophy rather than the Coach and this year it was won by Myah Booth, English Schools finalist. 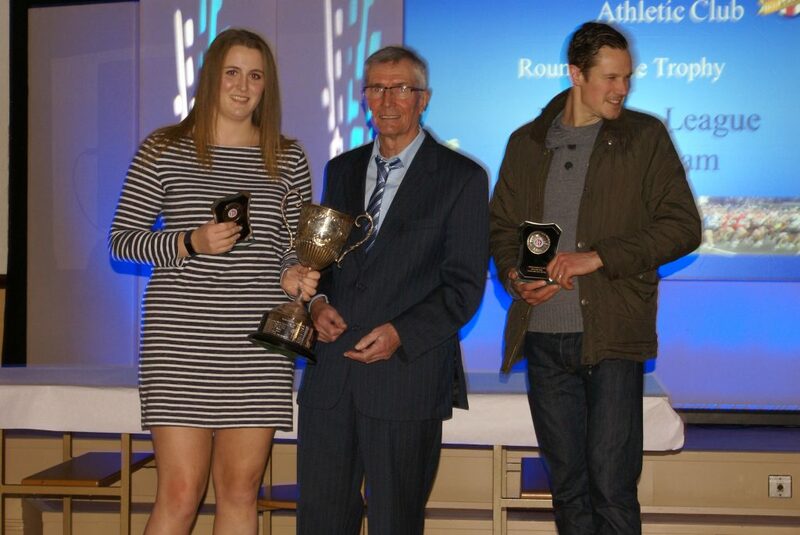 The second special Award presented was the Arthur Almond Trophy. 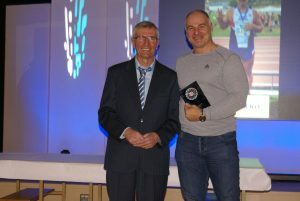 Arthur was one of the Harriers most succesful Middle Distance coaches. 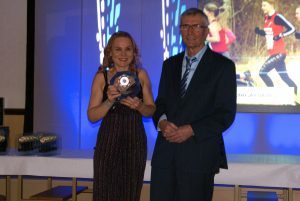 His wife Sylvia, donated this trophy to be given to a Middle Distance athlete who had performed at a very good level over the course of a season. 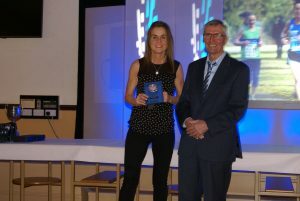 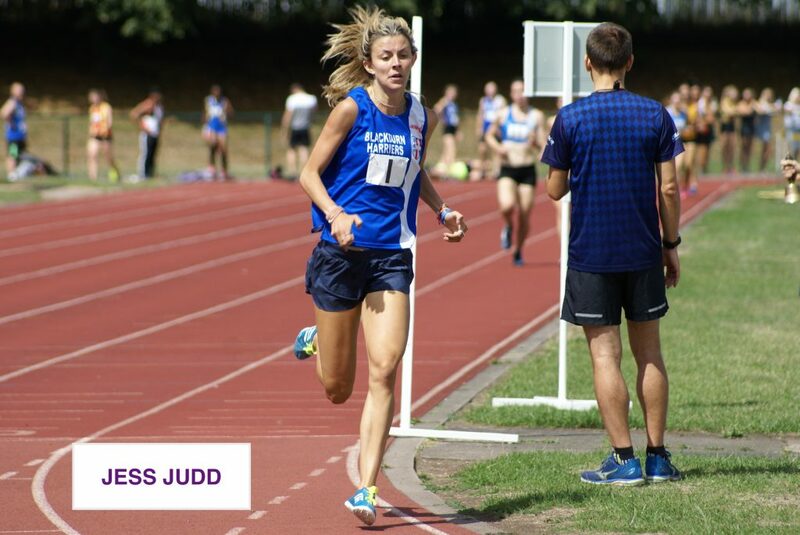 This year the Award went to Jess Judd for her time of 2.04 for the 800m run at Tipton in July. 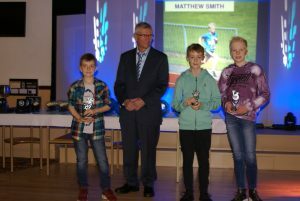 The Junior Squad Trophy was won by Matthew Smith for the Boys and Alisha Lehner for the Girls with George Ramsden, Findlay Carroll, Imogen Robinson and Isabella Knighton runners up. 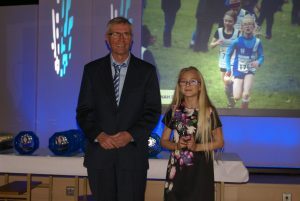 These athletes are chosen by the Harriers Sportshall Coaches. 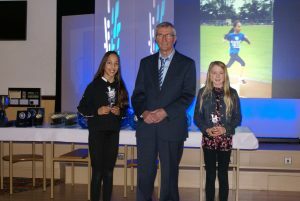 The U11 Endurance Award went to Daniel Smith, Oliver Gill and Hannah Davies – an award presented for U11 athletes who competed consistently in the cross country season. 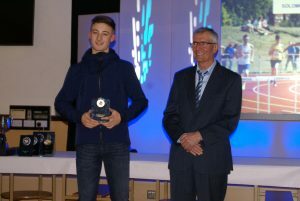 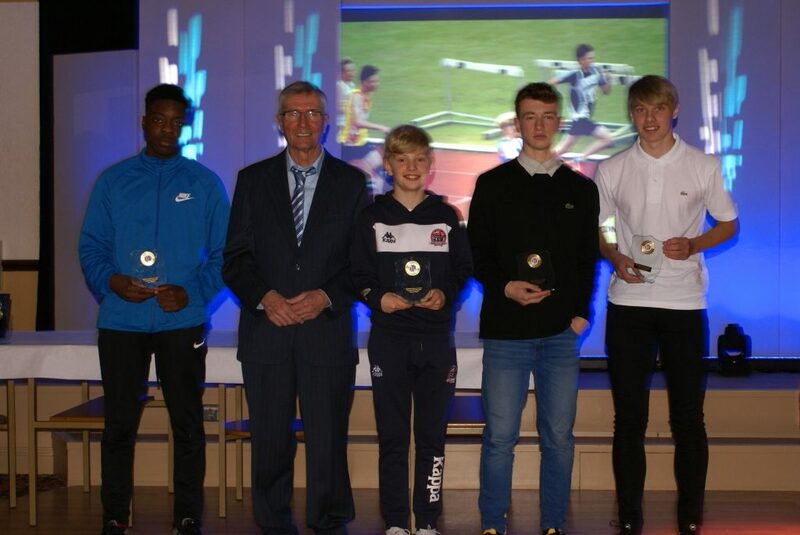 The Junior Team contribution to Track & Field over the season was split into age groups with Kyle Taylor-Pomfret and Matthew Heywood winning the U13/U15 Boys age category, Nicky Saunders the U13/U15 Girls, Anthony Kent (U17/U20 Men) and Bailey Madden (U17/U20 Women). 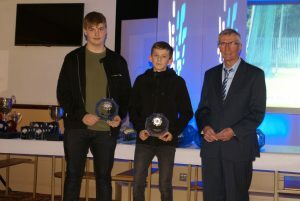 Our Junior Merit Award was split into U13 and U15 age groups with five winners in each age. 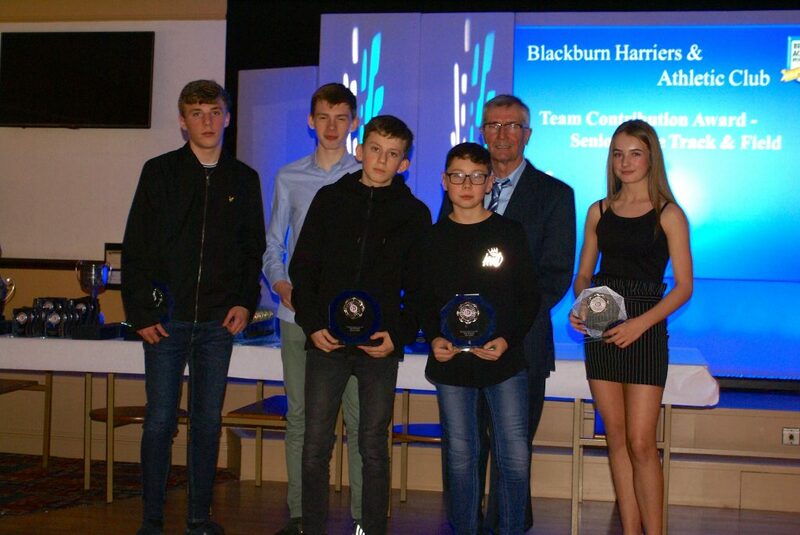 Niamh Gater, Daniel Smith, Tobi Olidapo, Codie Dewhurst and Isaac Butler won the U13’s and Kyle Taylor-Pomfret, Leah Hoole, David Holman, George Whittaker and Harvey Ashworth won the U15’s. 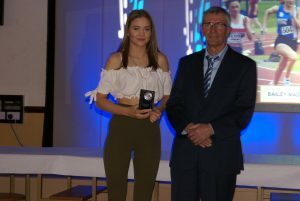 Senior Team contribution to Track & Field went to Tony Balko and Anna Peers for performances in the Northern League, Mid Lancs League, County and Northern Championships. 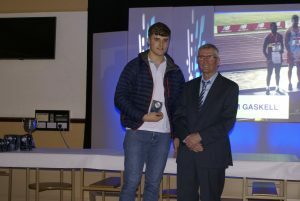 Senior Leagues Track & Field Merit Award is presented to athletes who are new to the squad and have impressed their Team Managers and Coaches throughout the season. 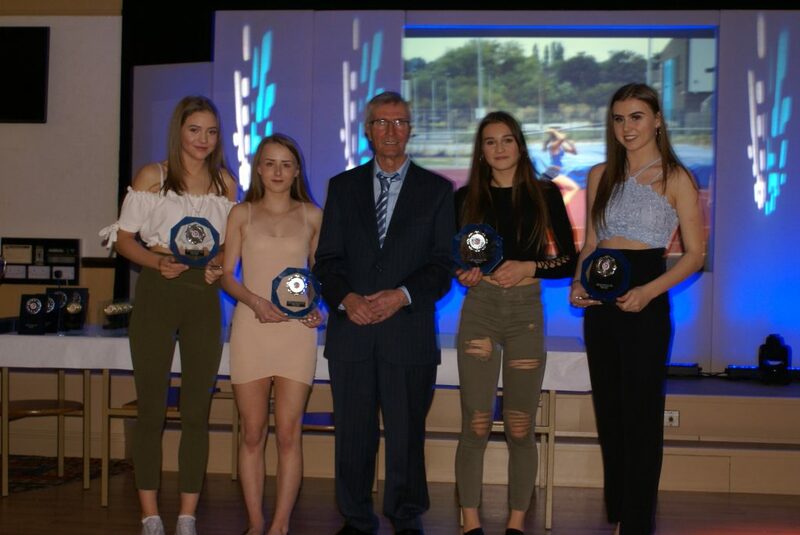 Mens winners were Jonathan Gough, Sam Hodkinson, Solomon Brown and Anthony Kent whilst the Women’s winners were Bailey Madden, Chloe Bleeks, Millie Coy and Emily Warren. 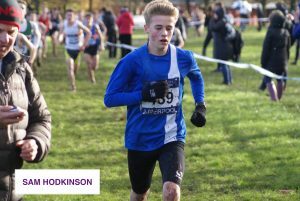 The Junior Team contribution to Cross Country for the Boys was won by Sam Hodkinson, Kyle Taylor-Pomfret and Matt Ramsden whilst for the Girls it was Eleesha Charnley and Caroline Woodoworth. 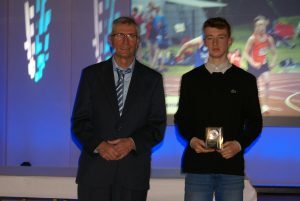 The Senior Award in this category was won by Chris Davies and Lindsay Davies. 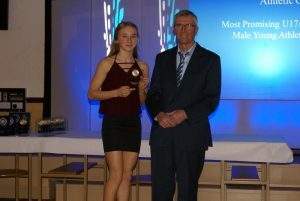 Splitting into age groups again, the next Award was presented for most promising young athlete which saw Hayden Mercer win the U13/U15 Boys, Eleesha Charnley (U13/U15 Girls), Joe Gebbie (U17/U20 Men) and joint winners in the U17/U20 Women – Millie Coy and Bailey Madden. 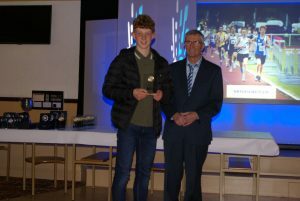 The Most Promising Young Athlete Award went to Kyle Mashiter, Ethan Downes, Tobi Olidapo and Harrison Allcock in the U13/U15 boys, Keira Haxton (U13/U15 Girls), Solomon Brown (U17/U20 Men) and Charlie Coy and Abigail Brown (U17/U20 Women). 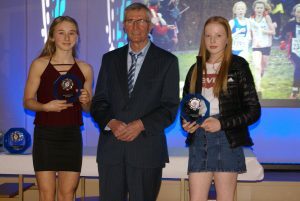 The Award for Oustanding Junior Committment is given in recognition of those athletes who have shown commitment and application beyond what be normally expected in ordeer to improve themselves or support their team mates – the winners being Maddie Elliott and Charlotte Williams. 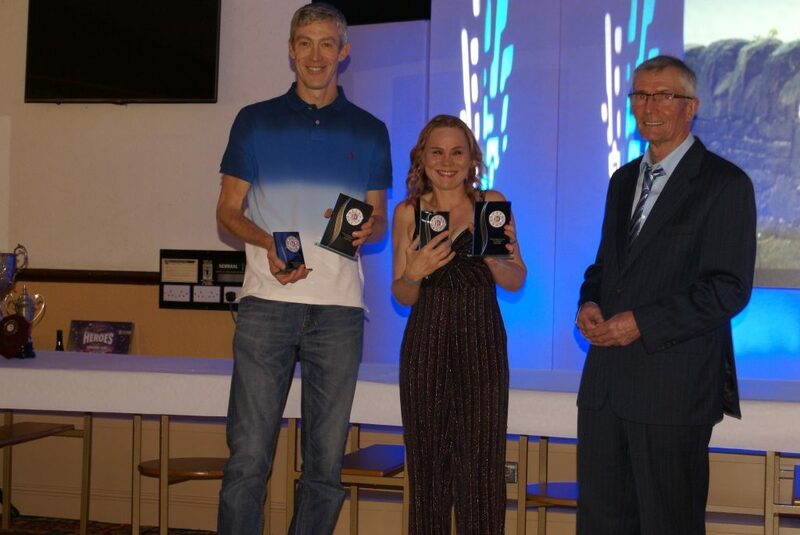 The Club Cross Country Award went to Rob Warner for the men after his 16th place in the Inter-Counties and 27th in the National Championships – and – to Joanne Nelson for winning the Mid Lancs Veterans Series and 2nd over all in the League. 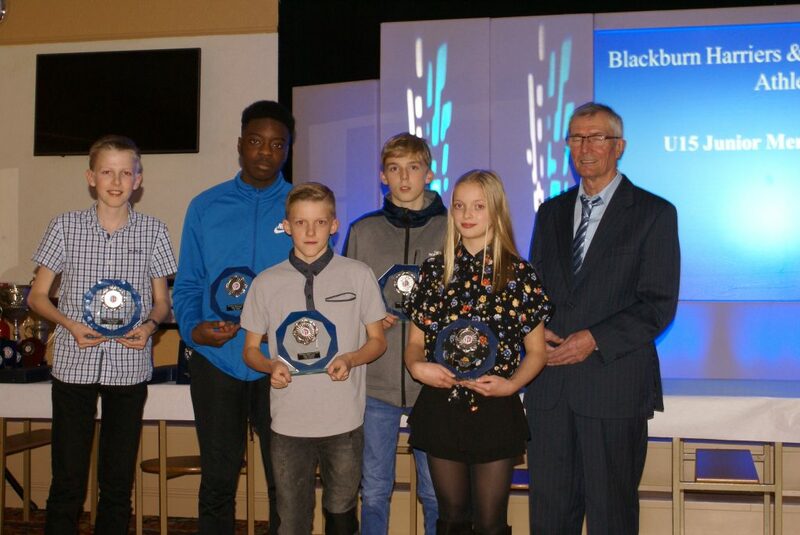 Joanne Nelson was back up again as a deserved winner of the Best Veteran Award along with Tony Balko picking up his second Award of the Evening. Joanne won six V45 Road Races alongside her cross country wins and Northern League track contributiuons over 3000. 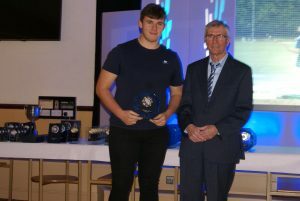 Tony won the award for his contribution in the Northern League and his performances in National and World Championships Throws competition. 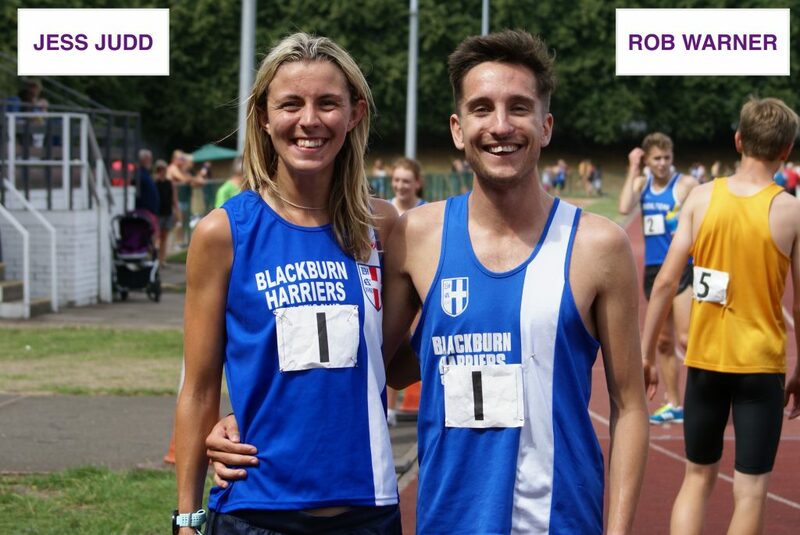 In the Road Veteran Road Running Award, it was wins for Chris Davies and Pauline Powell – Chris having won the Horwich Series (V40’s), Astley Park Series (V40’s), 4 x V40 wins in Road Races, 1 x V40 win at 10 miles and 2nd in the Half-Marathon. 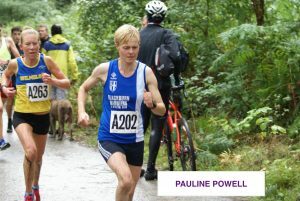 Pauline had 5 wins on the road, 6 wins as a V45 and is ranked 3rd nationally in the V45’s for 10k and 10m. 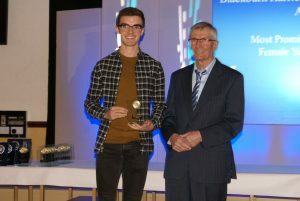 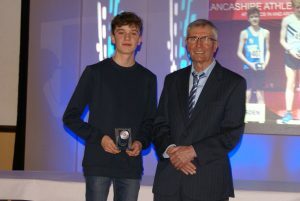 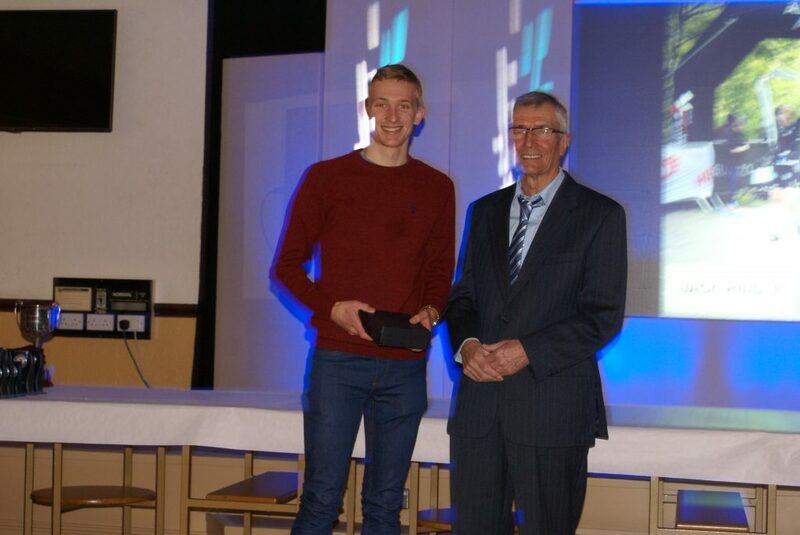 Blackburn Harriers Triathlete of the Year was Jack Hindle after his Series tremendous win in the Slateman, Snowman and Sandman Triathons, winning the Slateman and Snowman, finishing 2nd in the final event (Sandman). 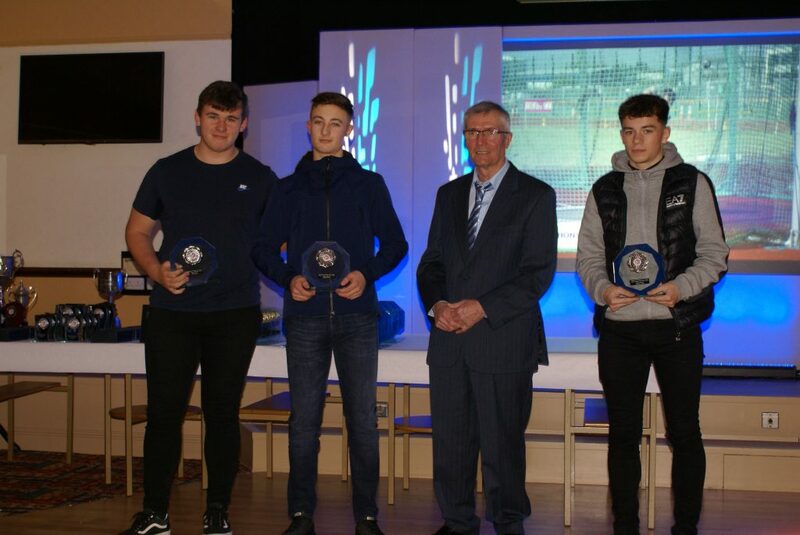 The Best Junior Field Performance went to Kyle Mashiter in the U13/U15’s Boys for his 5.39m Long Jump, Myah Booth in the U13/U15 Girls for her 10.99m Shot Putt Gold Medal at the Lancashire Championships, Sam Gaskell for his 68.75m Hammer Throw to win English Schools Gold and Charlotte Williams for her 57.41m Hanner Throw at Bedford in the U15/U17 National Championships. 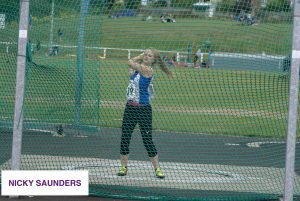 For the Seniors, the best Field performances came from sprinter Brandon Zinyemba for his 5.83m Long Jump in the Northern League and Holly Bradshaw for her new Club Record in the Shot Putt of 11.56m in the Northern League. 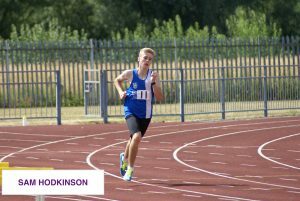 Best Perforamnce on the Track for Junior athletes ranging from U13 to U20’s and Seniors were won by Kyle Mashiter U13/U15 Boys 11.6 for 100m at Lancashire Championships, Myah Booth (U13/U15 Girls) for her 11.34 in the 75m Hurdles at English Schools, Matt Ramsden U15/U17’s for his 4.14.1 1500m at Lancashire Championships and Bailey Madden U17/U20 Women for her 12.6 100m at Lancashire Championships. 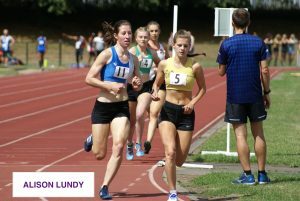 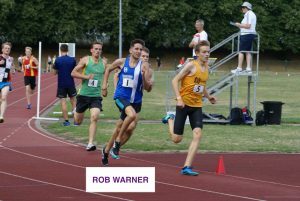 The Best Senior Track Performances of the year came from Rob Warner for his run of 3.48.45 in the 1500m at Loughborough and Alison Lundy for her 2.08.62 at Tipton. 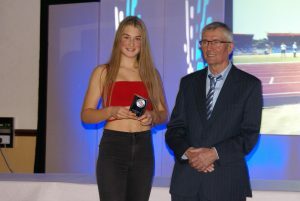 Each year an Award is given to the best perforamnces at the English Schools Championships. 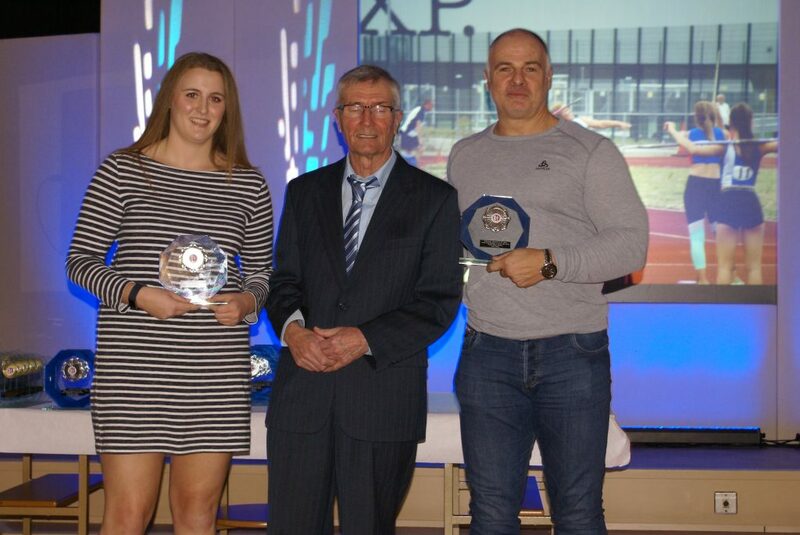 This year was exceptional as Sam Gaskell won the Championships in the Hammer with a throw of 68.75m whilst Myah Booth ran a better than national standard and a new personal best in the 75m Hurdles of 11.34. 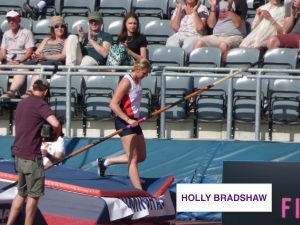 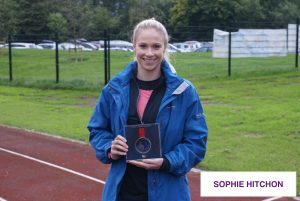 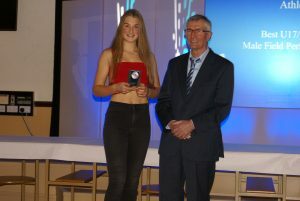 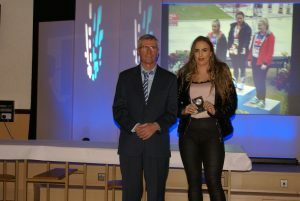 Outstanding Achievment Awards in Track & Field were won by Holly Bradshaw after winning the Bronze Medal at the European Championships and Sophie Hitchon for her 2nd place in the Athletics World Cup. 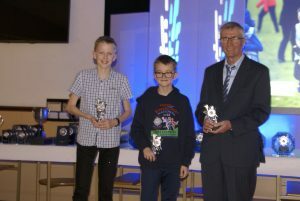 The Club Championships and Handicap Championships was a double success for Chris Davies and Lindsay Davies, both of whom won the Championship and Handicap Championship. 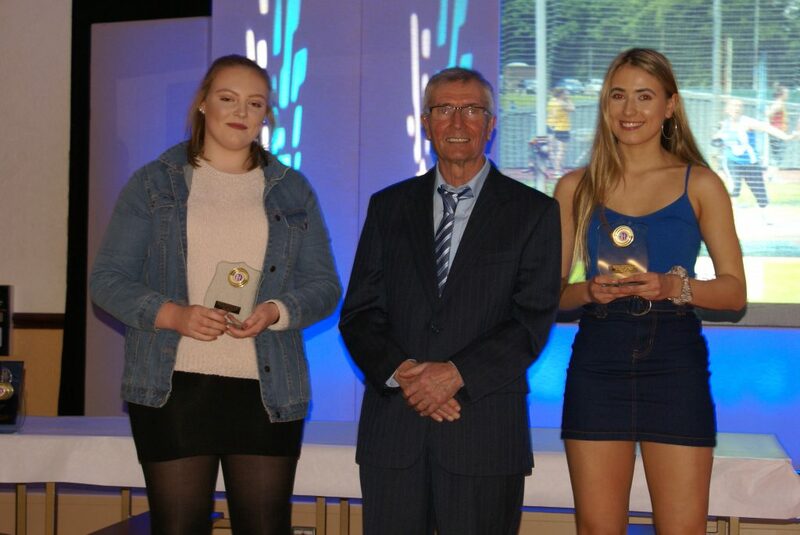 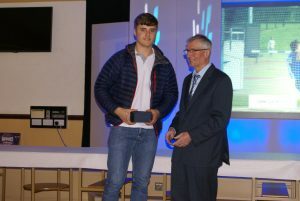 The Young Athlete of the Year Award went to Sam Gaskell and Myah Booth, the Award being given to the Junior Athletes who have performed to the highest standards throughout the year whilst the Senior Award went to Rob Warner and Jess Judd. 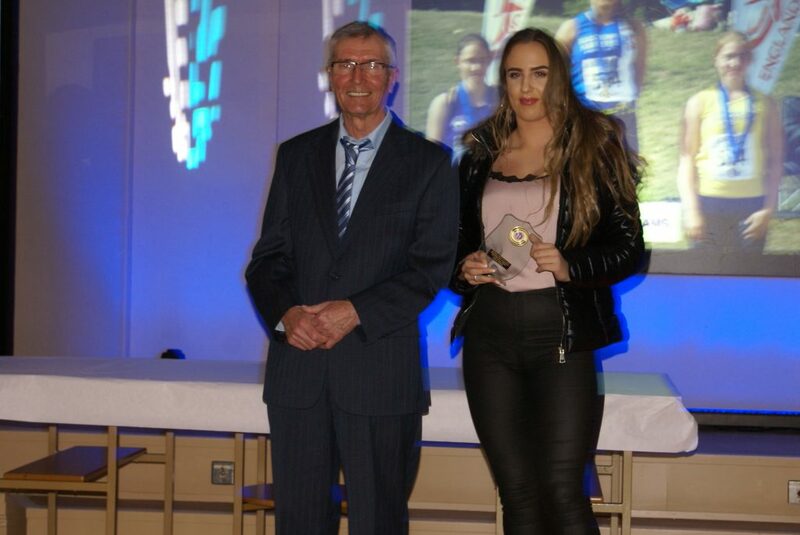 The Final Award of the evening is the Round Chase Trophy presented to the the Team or Squad who have achieved the best overall performance of the year. 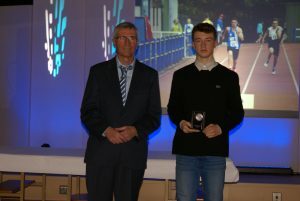 This time, the Award went to the Northern League Track & Field Team who set out at the beginning of the season to win Division 2 and get to the Promotion Match where they would have a chance to be promoted to Division One – and that is exactly what they achieved to end a great season for all those athletes involved and for the Club.